Kusadasi has grown from a small sleepy fishing village into a sprawling tourist center, serving the thousands of tourists who flock to the area to visit the nearby ruins of Ephesus. These ancient ruins are considered the most important in Turkey. Leaving the colorful town of Kusadasi behind, you will pass through the verdant countryside before arriving at Ephesus. Once you enter the Open Air Archeological Museum of Ephesus and pass by the Magnesia gate, you will enter the administrative section of ancient Ephesus. You will return to the motorcoaches through the Arcadian Way, where Mark Anthony and Cleopatra once rode in procession. The tour will then continue to the Terrace Houses. Ephesus terrace houses are located on the hill, opposite the Hadrian Temple. 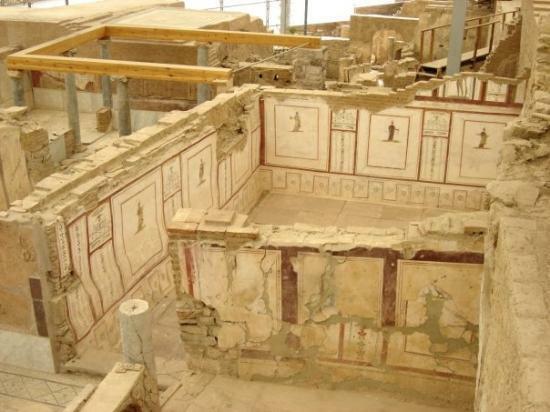 Also called as "the houses of rich", important for the reason give us information about family life during the Roman period. They were built according to the Hippodamian plan of the city in which roads transected each other at right angels. There are six residential units on three terraces at the lower end of the slope of the Bulbul Mountain. The oldest building dates back into the 1C BC and continued in use as residence until the 7C AD. After the termination of the visit to Ephesus, your motorcoach will take you to Kusadasi. This tour is for groups of up to 4 passengers. If you wish to visit religious sites during free time please dress appropriately, no bare shoulders or shorts are allowed in churches Excursions listed for a port may not be available for every cruise.You may want to bring a camera. This tour is for groups of up to 4 passengers.